Joanne has been training students in jewellery-making since year 2003. 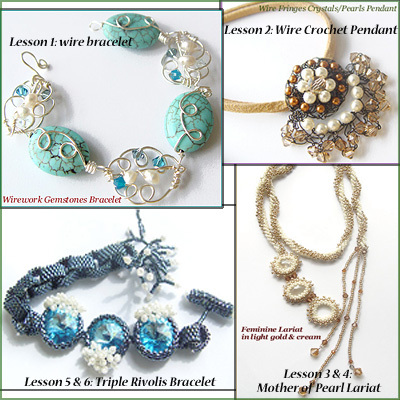 She is a self-taught and versatile trainer in many areas of skills, including bead weaving, wirework, bead crochet, bead knitting, polymer clay, and other contemporary techniques. She constantly updates her design pieces with modern inspirations and creative use of crafting materials. During her free time, she researches on latest jewellery-making trends that appeal to different age groups, from the young to the matured enthusiasts. This is an elementary jewellery making course for anyone who is interested in designing their own jewelleries. The supplies used in this course will be mainly swarovski crystals and pearls, other supplies will be gemstones, assorted acrylic beads and silver parts. Swarovski accessories are now the latest fashion in the market among the young and old. It is classy and lasting! The course teaches the basic tools and equipments used for jewellery making. At the end of the course, participants will be able to make their own beautiful and classy accessories like earrings, necklaces and bracelets. (b) An additional fee charges of $20 for individual training. Participants can upgrade themselves by attending the Intermediate Course. The jewellery making process for this course will be more elaborated. 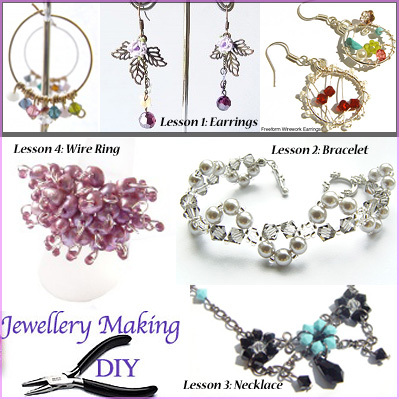 Learn to make jewellery the professional way. In this Intermediate level, we explore into various techniques of making your jewellery pieces. 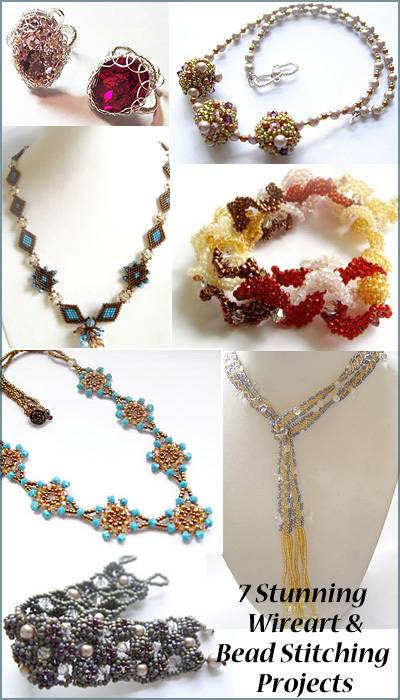 Techniques include wirework, beads weaving, beads stitching and wire crocheting. Introductory various beads stitching techniques & cover wirework shaping, twisting and coiling. 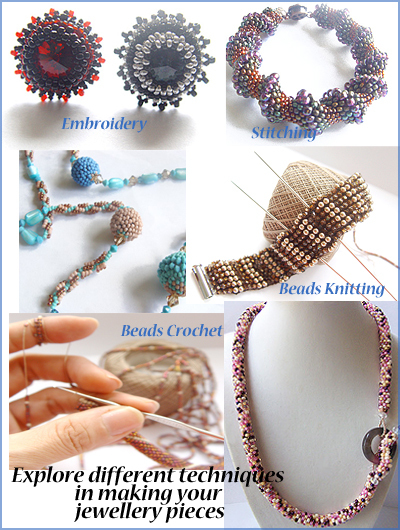 Introductory to various threads and needles for beads stitching. 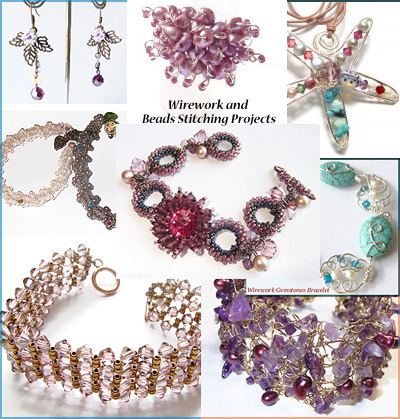 Using freehand with round nose pliers, making wire shapes and embellish finished wire work project with beads and crystals. Learn how to use beads to hold a beautiful stone or rivolis (with or without hole) in place. Crocheting with wire. 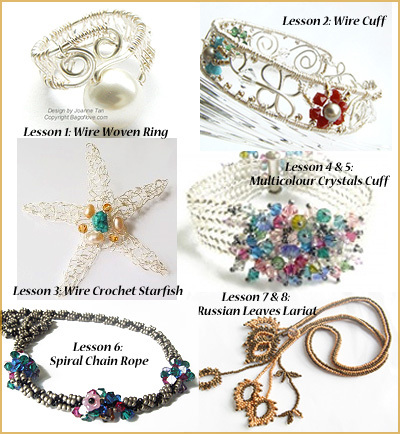 Fun and Creative way of making bracelet and earrings, all made using wire. (b) An additional fee charges of $30 for individual training. This course is for students who have already attended the intermediate level. In this course, we will learn to combine a variety of techniques for an exquisite showpiece. (b) An additional fee charges of $50 for individual training. 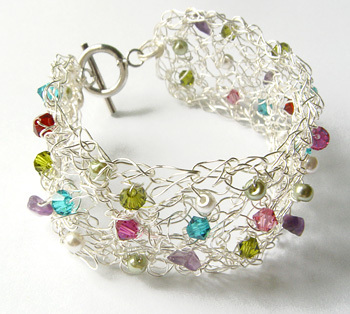 Coiling, wrapping, shaping and spiralling, combining beads and wire to create a dramatic cuff. After you've mastered this technique, there is no end to the number of ways you can alter the technique to allow for your imagination to create many wonderful designs. Learn to make popular Russian leaves using diagonal peyote stitches. Include tubular herringbone rope, and ending and adding thread. Learn to make this cheerful bracelet with ladder, flat herringbone stitches, and ending and adding thread. Learn how to trap a cabochon in a netted bezel, creating a fabulously elegant pendant or ring. In this lesson, we will weave a netted Bezel into a fabulous ring. 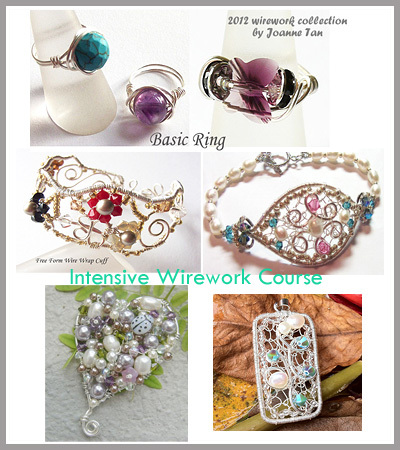 Learn to make strong wire coiled base and embellish it with thin wire and beads. Stringing the fancy wire beads into a rich-looking necklace. 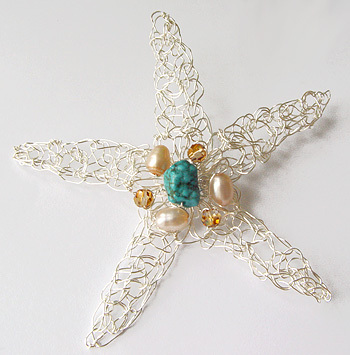 Learn to stitch this wavy coral in cool coloured seed beads, embellish it with sparkling crystals. Versatile long necklace that can be worn in many creative ways to suit your style. Combine 4-drop right-angle weave and tubular peyote stitch to create this stunning cuff. Create this stunning necklace using brick stitch, embellish with swarovski crystals. Learn how to increase and decrease your bead count in brick stitch for even more shaping opportunities. Materials used: Swarovski crystals AB 2x, Delica seed beads. Learn basic stitch in embroidery. Introduction to appropriate backing material for beaded embroidery. Practice basic knitting and stringing beads on lesson 2. Knit the actual bracelet with beads on lesson 3. Material inclusive: manual, thicker thread for practice, knitting thread, knitting needles, Bar slider magnetic clasp, 3mm Swarovski Pearls and Crystals. In this lesson, we will practice how to crochet beads with bigger size beads. Once you've mastered the skill, you will complete your work at home. Bring the completed crochet rope back on lesson 6 for review. Material inclusive: manual, practice beads, seed beads (choice of blue and pink tone rope), glass beads, donut agate and crochet hook. In this lesson, you will learn to wrap a big bead with smaller beads. You will learn increase and decrease in peyote using different size seed beads, and as well as using same size seed beads to make the increment and vice visa. We wiill create a cheerful spiral necklace with your designer’s beads . The long necklace can be worn long or tie a knot over one of the beaded ball to create a different look with shorter length. It's fun, fun, fun and most important very unique! Material inclusive: manual, seed beads, 8mm bicone swarovski crystals, 4mm crystals, shell pearls, thread and needle. The Cellini spiral is a modified version of tubular peyote. The stitch is even-count peyote, with a step-up at the end of each round. The different size beads create the spiral. Step by step instructions to guide you finish this bracelet at home. 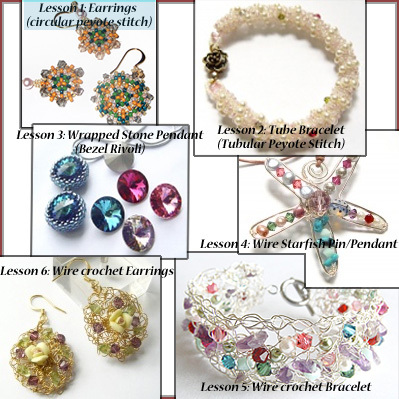 In this lesson, we will learn to make a pair of dangling triangle earrings. The second pair is a retro stud earrings, instructions will be given to you to complete it on your own. 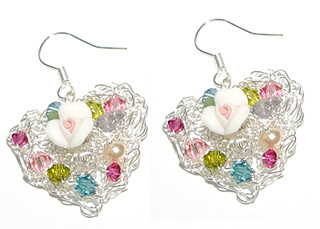 Choice of 3 colours for the second pair earrings. Material inclusive: Embroidery backing material, 14mm Swarovski Rivoli, seed beads, 3mm Swarovski Pearls/Crystals, thread, needle and clasp. beads will be provided to make up to 18 inches necklace, estimated about 88 pearls and 70 crystals used (each strap about 9", exclude pendant drop). Technique learn in this lesson: Pondo stitch also known as African circle stitch. Learn to increase and decrease beads count in stitching the flower. Material inclusive: manual, seed beads, 8mm Swarovski crystal round (as button clasp), 3mm crystals, thread and needle. beads will be provided to make to your preferred wrist size. Weaving 4mm round agate beads into tube and embellish with seed beads' cross-stitches. Add a matching 10mm round Sunstone bead as clasp - Sunstone is a joyful, light inspiring stone linked to luck and good fortune. These beads come in a beautiful dusky pink tone with a unique glisten making them a great quality bead. Learn to wrap stone with corner. In this lesson, we will learn how to bezel teardrop using the same size seed beads to wrap the tear drop, learning how to increase and decrease count at the pointed end of the stone. Create a matching necklace strap – technique of this stitched is called “St. Petersburg’s Chain”,a feather-like stitch. Use these open shapes to make bracelet, earrings or toggle clasps. Learn more complex tatting in creating this victorian lace necklace –Learn stringing pattern and forming loops and chains. Chunky and dazzling cuff - 2-drop peyote stitch to make the bracelet band and decreases bead count on both end of bracelet. Embellish the band with swarovski pearls flowers and beaded leaves. Technique: the ruffled lace in this necklace is produced using horizontal netting stitch. (Knowledge Level: Basic foundation to Advance level 1) . 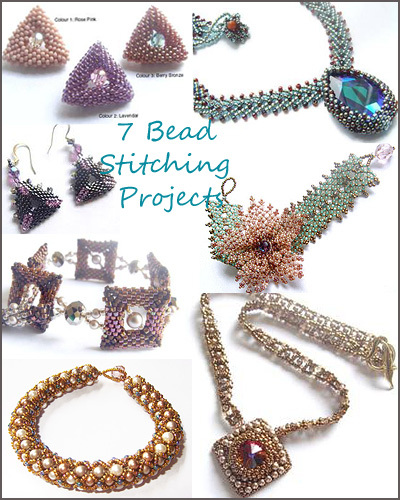 Learn about 8-10 projects, from wirework to beads stitching, equip you with the power of exploring and creating more stunning pieces on your own in future! Crocheting with wire isn't difficult - it is just different to working with yarn. 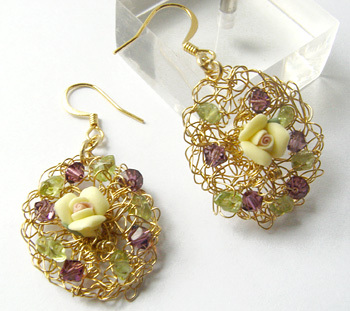 Great items of jewellery can be made by crocheting with wire. Fun and Creative way of making your own necklaces, earrings, bracelets and brooches - all made using wire. Crocheting takes on a new dimension in this fun and creative class. Those new to crochet will get all the basics of crocheting, including finishing off, adding new wire, and planning projects. Beaders will delight over a new way to play with beads, and seasoned crocheters will relish this fresh, innovative approach to a time-honoured, favourite technique. For anyone who is a 'Fan' of wirework! *discount will be given to group training. Polymer clay is a fun, versatile sculpting medium that can be used to make a variety of crafts, jewellery, and artistic character sculptures. 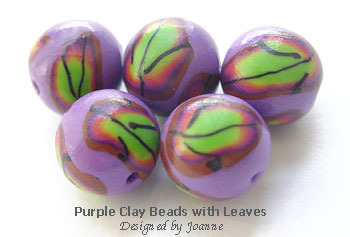 Polymer clay does not need the high temperatures required for firing, and instead can be baked in a home oven. This course is designed for anyone who wants to create their own unique beads. 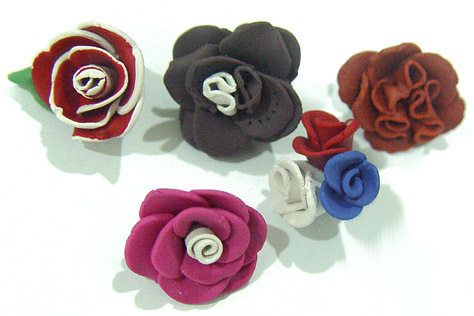 * Make your very own clay flowers. * Various techniques like shaping and cutting flower's petals will be taught. * Mixing clay colours and transform to different colour effect. 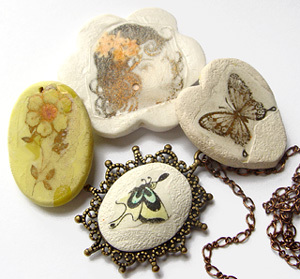 * Design your very own pendant, keychain or dangles with your favourite photo or drawing on it. * Using slices from this cane, you can transform them to beads which will be baked and made into a pendant. You can form a minimum of 3 friends to have the course conducted at your premise. You can also customise the content of the course, like what you would like to learn or achieve at the end of the course. Jewellery courses for kids are also available (Special birthday party - Call us today, we will make them very happy!). We have conducted numerous courses for corporate organisation - for their monthly recreation, at their premises. Usually course will be conducted at a one-time basis with 1 jewellery design like making crystal bracelet, necklace or earrings. We can propose the type of jewellery to make according to your organisation's budget.